From the Bottom to the Top End. Swinging gently in the breeze from the verandah of The Boathouse, our Bruny Island shack, my wood-fired fish with ghost net tail spirals endlessly, reminding me of my most recent visit to the Top End. 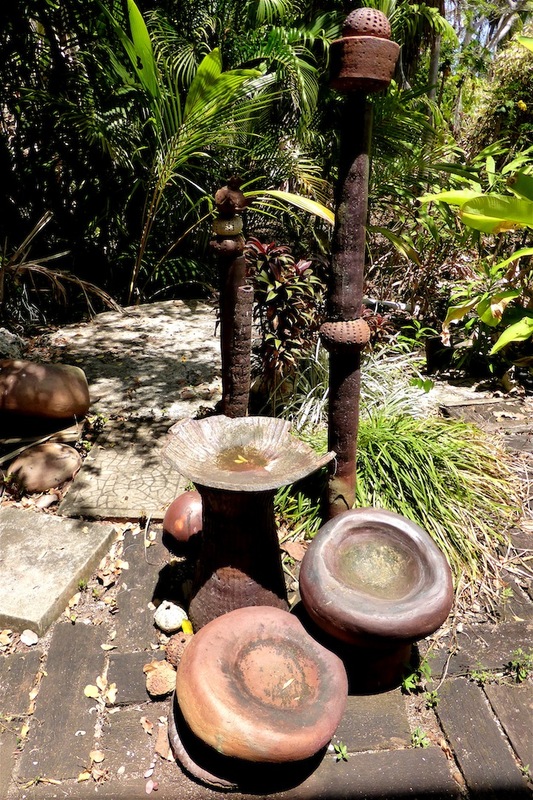 This most latest of Top End adventures was a working trip looking into the wood-fired work of the artists of Erub, Darnley Island in Queensland’s most north. (Article to appear in Ceramics: Art & Perception sometime soon). 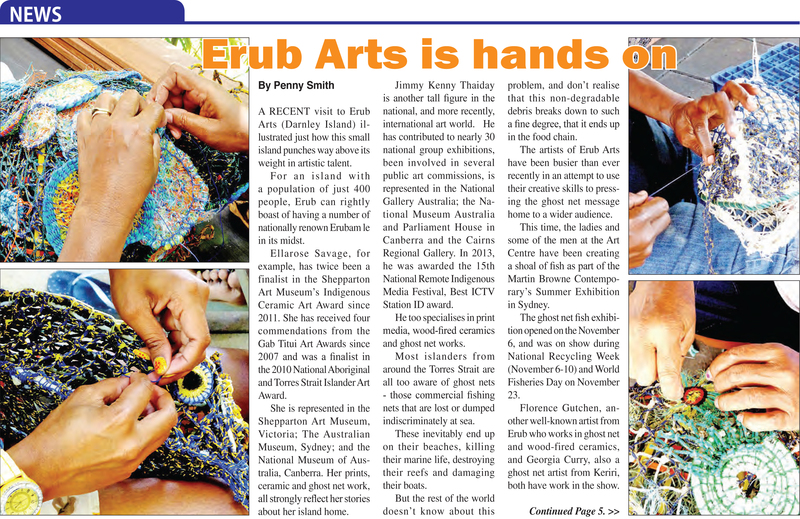 The tiny jewel that is Erub is an island that punches way above its weight in artistic talent. For an island with a population of just 400 people, Erub can rightly boast of having a number of nationally renown Erubam le in its midst. 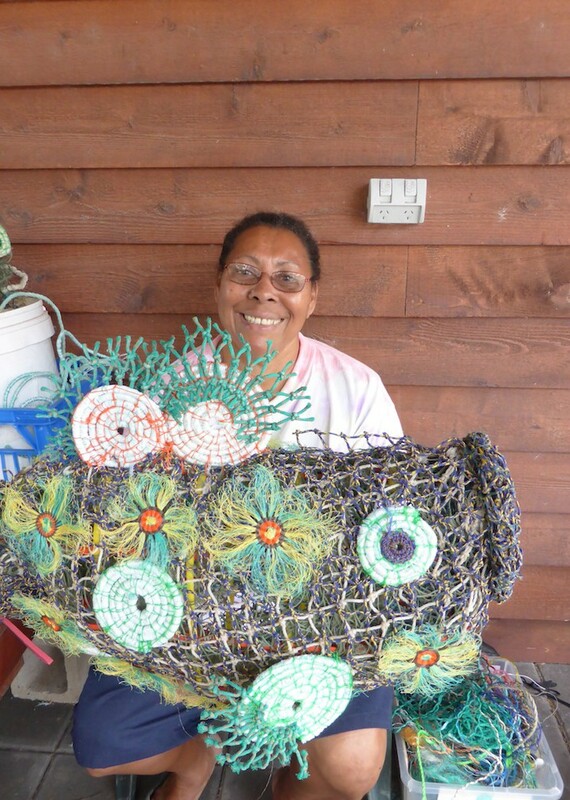 Amongst them, Ellarose Savage, who created my spinning fish and whose feathery ‘ghost net’ tail reflects a unique story. 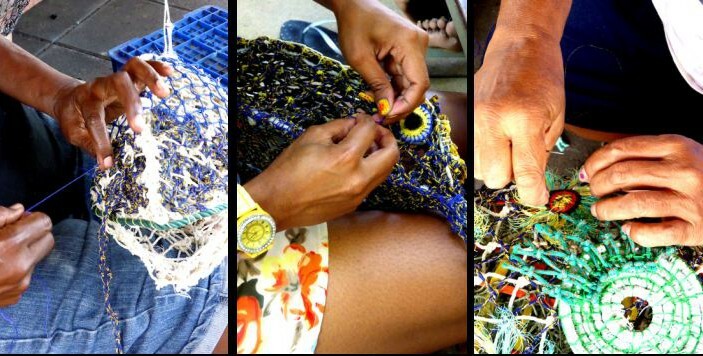 Most islanders from around the Torres Strait are all too aware of ‘ghost nets’ – the commercial fishing nets that are lost or dumped indiscriminately at sea. These inevitably end up on the islander’s beaches, killing their marine life, destroying their reefs and damaging their boats. But the rest of the world don’t know about this problem, and don’t realize that this non-degradable debris breaks down to such a fine degree, that it ends up in our food chain. The artists of Erub Erwer Meta, Erub’s Art Centre, however, press the ghost net message home to a wider audience through their art in a particularly erudite and colourful fashion. Racy Pitt, (featured above working on her ghost net fish) and the ladies, girls and some of the fellers at the Art Centre where busy creating a shoal of ‘ghost net’ fish as part of the Martin Browne Contemporary’s Summer Exhibition in Sydney at the time of my visit. Watching the women work on their fish in the shade of Erub Erwer Meta, Brunyfire was acutely aware that each piece carried its own unique story. The women’s beautiful, nimble fingers worked a magic in turning this lethal waste of the sea into beautiful and magical art objects. They unraveled, entwined, twisted and wove this unforgiving material into forms that were alive with colour and meaning. As a guest of the Centre, with a brief to write about the wood- fired work of a number of the artists, Brunyfire stayed with gracious hosts, Walter and Diann Lui (the Director of Erub Erwer Meta). And it was here that I had my first lesson in the versatility of the humble coconut. 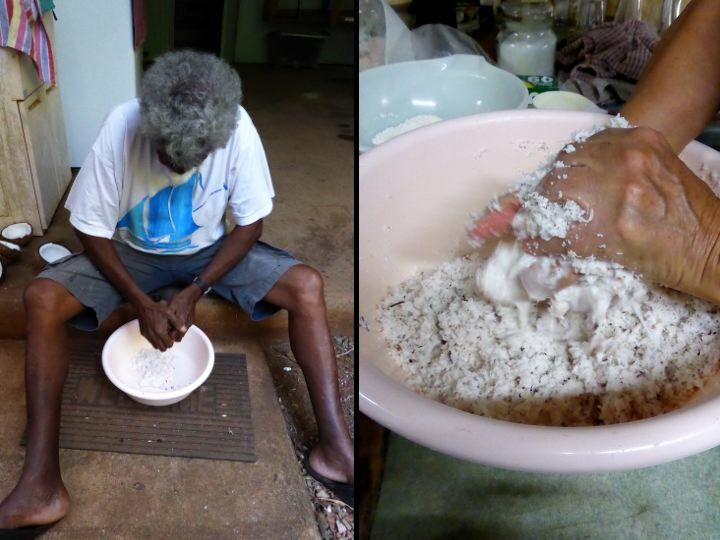 To a keen food enthusiast this was a rare treat into learning how to prepare and cook a local Torres Strait island dish – in particular, sabee banana. 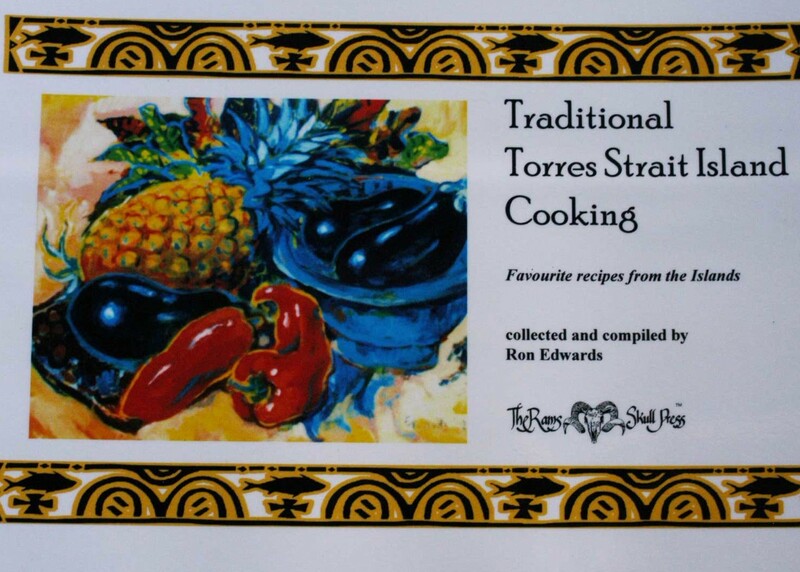 In his cookbook, Traditional Torres Strait Island Cooking………. ………..Ron Edwards explains to those not in the know, that those dishes carrying the prefix ‘sabee’ before it generally refers to dishes that have been simmered in coconut milk. So sabee banana is simply banana cooked in coconut milk. I also learnt that sabee banana was a dish served with the main course, in this instance, beer battered fish (caught that morning by Walter) and was not a desert, and that plantains were used rather than bananas. Plantains are considered to be more a vegetable than a fruit, are low in sugar, (working more like a potato in savoury dishes) and when they are ripe, they can be quite black in colour. 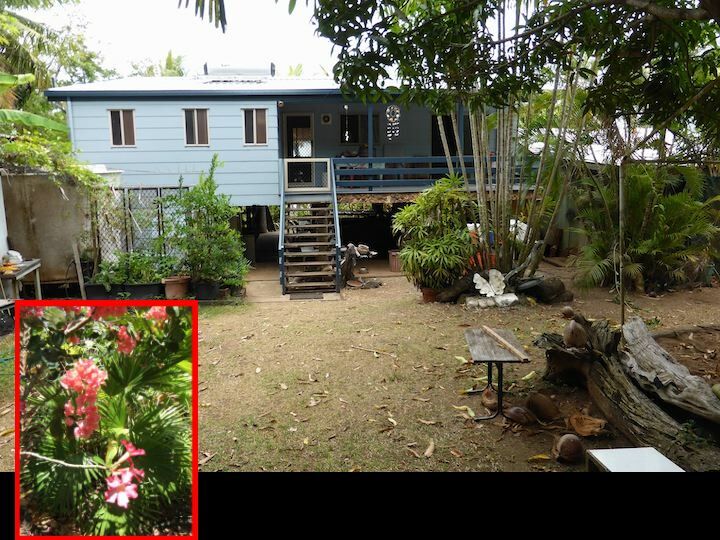 For this recipe, both coconuts and plantains came from the Lui garden…….. ………..a beautiful tropical jungle featuring a number of Diann’s ceramic works. The coconut (Cocos nucifera) got its name from the early Spanish explorers, who named the nut ‘coco’, meaning ‘monkey face’ thanks to the three indentations or eyes on the hairy face of the nut. This amazing fruit provides a nutritious source of meat, juice, milk, oil, and in the case of Walter’s special barbecued fish, fuel. Coconuts are highly nutritious – rich in fibre, vitamins and minerals with many health benefits beyond its nutritional value. Coconut oil is considered to possess healing properties over any other dietary oil and is extensively used in traditional medicine among Asian and Pacific populations. Pacific Islanders consider coconut oil to be the cure for many illnesses and consider the coconut palm so highly as both food source and medicine that it is often called ‘The Tree of Life.’ Only recently has modern medical science unlocked the secrets of the coconut, validating its amazing healing powers. As most islanders already know, the green coconut makes for good drinking, but these have to be climbed for. 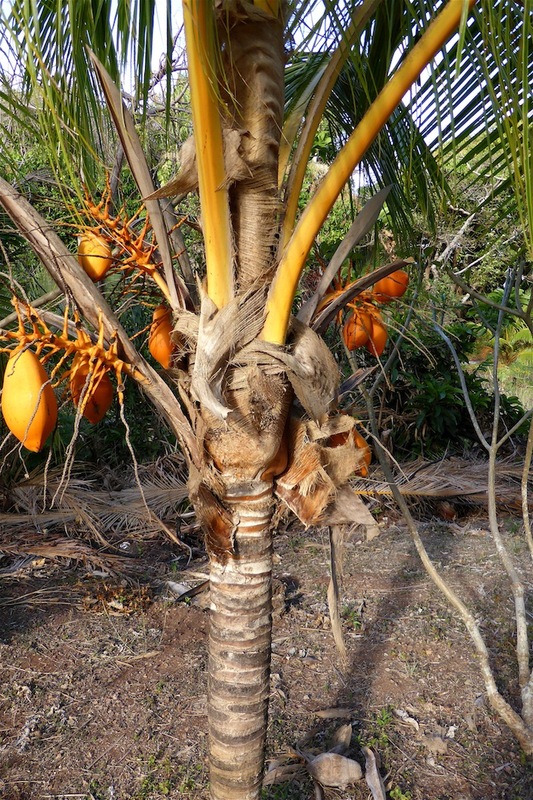 The nut for making coconut milk on the other hand, falls to the ground in its own time when the outer husk is brown. And whilst the above coconut is a decorative feature in the Lui garden, Walter is adamant about not using tinned coconut milk, especially when a far better product is to be had with just a bit of elbow grease. 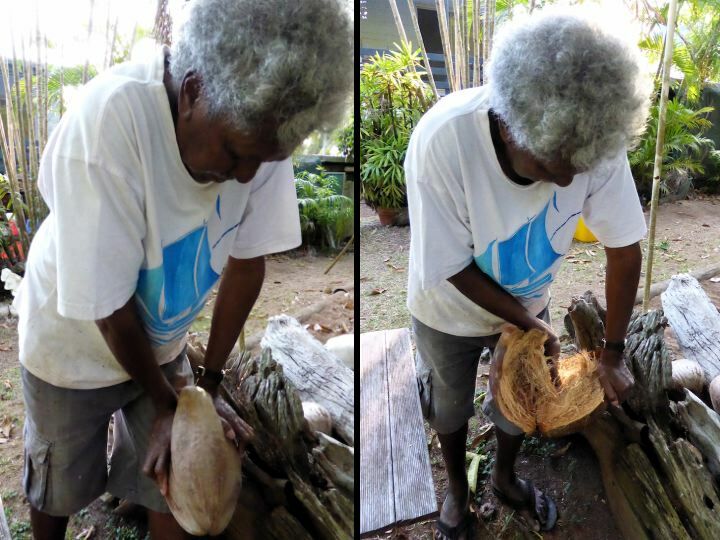 For this recipe, Walter gathered up 3 coconuts from his garden, and using an old pick head wedged into a convenient log…….. ………proceeded to peel off the outer skins, saving the husks as barbecue fuel. Hefting an evil looking cleaver in one hand and the nut in other, Walter then deftly tapped a line around the nut’s middle, neatly dividing it into two, saving the juice and revealing the beginnings of a coconut seed. This latter is unusual, but was delicious with a subtle coconut taste, but with a delicate crunchy texture. 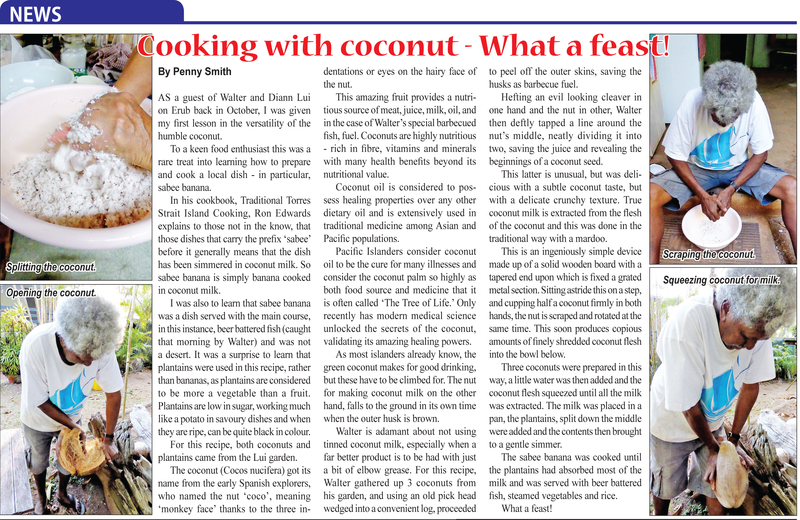 True coconut milk is extracted from the flesh of the coconut and this was done in the traditional way with a mardoo. This is an ingeniously simple device made up of a solid wooden board with a tapered end upon which is fixed a grated metal section. Sitting astride this on a step, and cupping half a coconut firmly in both hands…….. ……..the nut is scraped and rotated at the same time. This soon produces copious amounts of finely shredded coconut flesh into the bowl below. 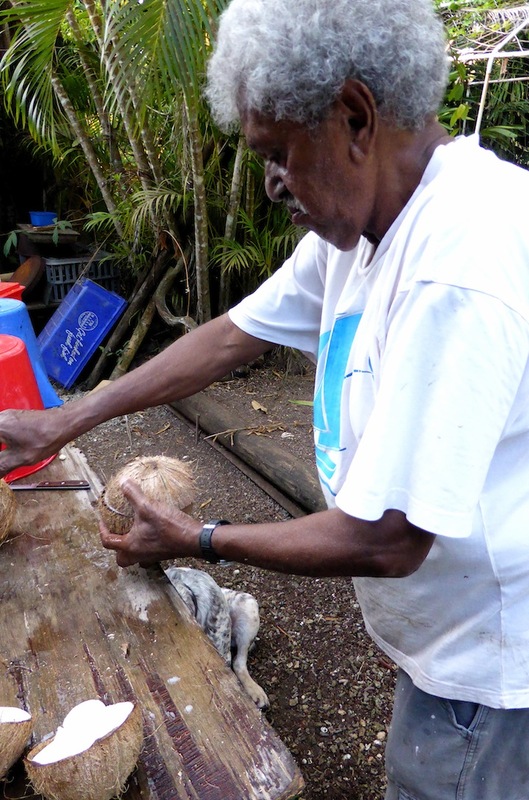 Three coconuts were prepared in this way, a little water was then added and the coconut flesh squeezed until all the milk was extracted. 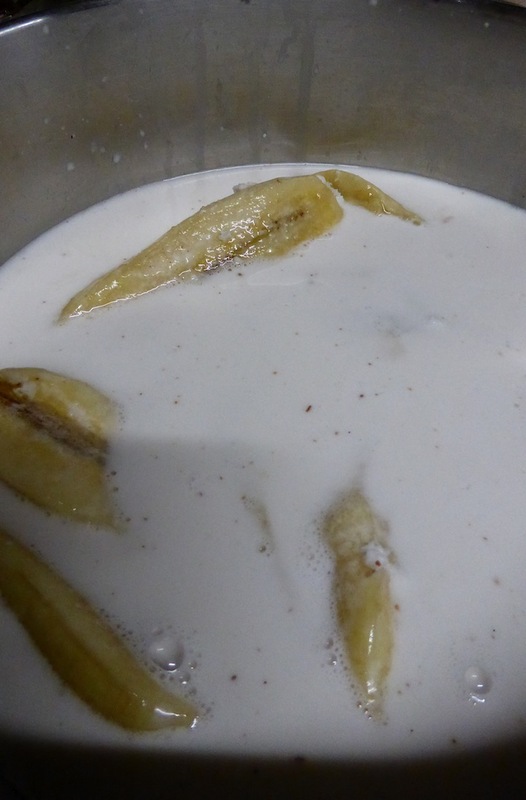 The milk was placed in a pan, the plantains, split down the middle were added and the contents then brought to a gentle simmer. 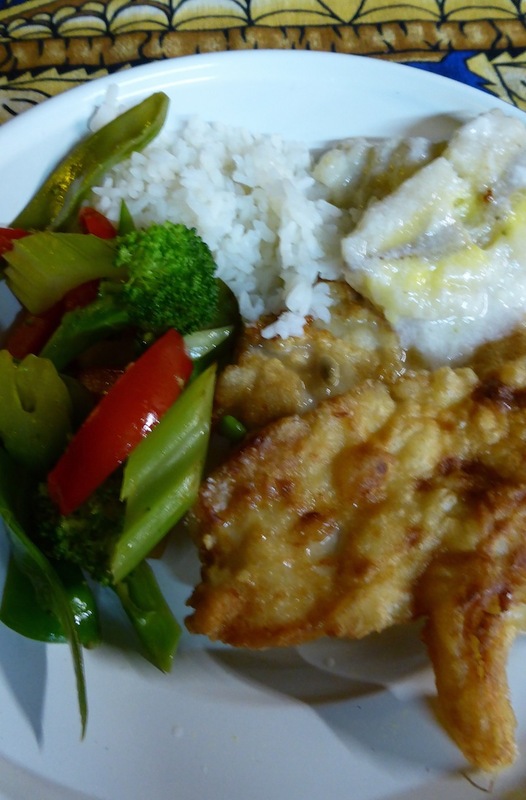 The sabee banana was cooked until the plantains had absorbed most of the milk and was served with beer battered fish, steamed vegetables and rice. Stop press!! 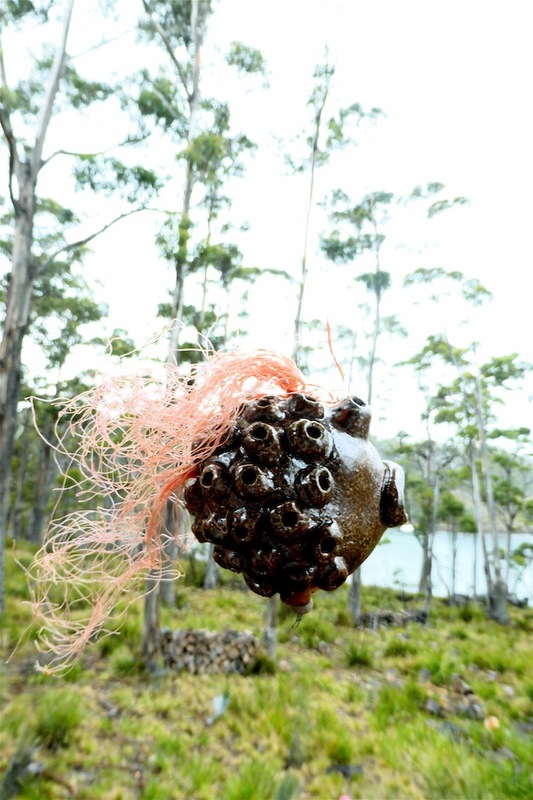 A couple of articles written for the Torres News on Ghost Nets and Bush Tucker.